Old World - New World. Location: Atacama desert, Chile. Grid Reference: 19°55' S, 69°38' W.
The Atacama desert is best known as the location of the huge 'Atacama Giant', the largest geoglyph in the world (right). However, the Atacama desert in Chile is also officially the oldest, driest desert in the world (1). Perhaps surprising then that it should also turn out to be the location of a vast sprawling prehistoric complex unlike any other in the Americas. Perhaps ironically, it is the historical lack of water in the region that has preserved the remains of this incredible discovery, which lies today, partially concealed beneath the silt of an ancient flood event. The Atacama Giant is a largest of over 5,000 geoglyphs in the Atacama Desert, Chile. Because of its high altitude, dry air and nearly non-existent cloud cover, the Atacama desert is one of the best places in the world to conduct astronomical observations (2), supporting the suggestions that the Atacama Giant may have been built as a lunar calendar for knowing where the moon would set; from which the day, crop cycle, and season could be determined. The points on the top and side of the head are suggested to show which season it would be depending on their alignment with the moon, although as yet, there has been no substantial proof of this supposition. More than 5,000 geoglyphs—prehistoric works of art placed on or worked into the landscape—have been recorded in the Atacama Desert of northern Chile over the past thirty years. 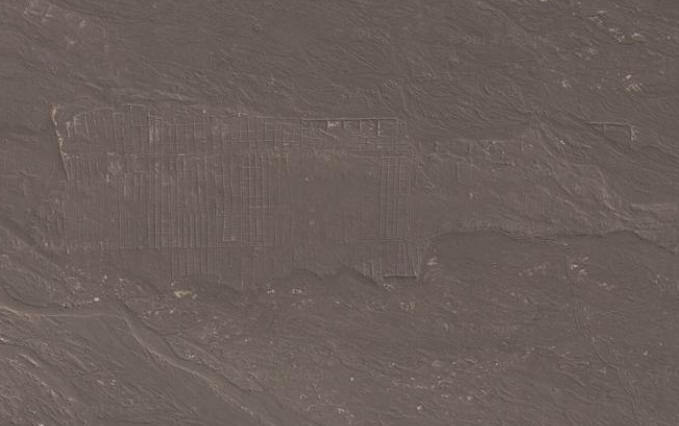 The Chilean glyphs in the Atacama Desert are far more numerous and varied in style, cover a much larger region (150,000 km2 versus the 250 km2 of the Nazca lines), and are currently believed to have been constructed between 600 and 1,500 AD. 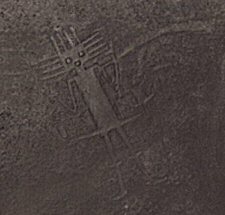 Both the Nazca lines and the Atacama glyphs had multiple symbolic or ritual purposes; while some scholars believe the Atacama glyphs additionally had a vital role in the transportation network connecting the great South American civilizations. More anthropomorphic geoglyphs lie directly south of the Atacama giant (far left). The Chilean glyphs were built and refined by several South American cultures—likely including Tiwanaku, Inca, Atacameño as well as less-advanced groups—the widely varied geoglyphs are in geometric, animal and human forms, and in about fifty different types. Using artefacts and stylistic characteristics, archaeologists believe the earliest were first constructed during the Middle Period, beginning around 800 AD. The big question is... Were they built before or after the decline of the complex. South of the Atacama Giant, and partially covered beneath an ancient flood plain, the outline of a vast ancient complex has been identified. Although no housing or civil-structures have yet been officially identified, the complex is clearly man-made and measures at least 5 miles in diameter, so that whether is is a city, or an ancient agricultural system, it is still the largest known of its kind in prehistoric Chile and ranks alongside the largest man-made complexes in the Pre-Columbian America's. Approximate location of Nuevo Albergis: The white sections are salt deposits, marking dried up waterways. Apart form being next to the largest geoglyph in the world (Other Chilean Goeglyphs have been suggested to have been placed next to important trade routes), it can be seen that the complex was built at the end an ancient river system which is now essentially dried up. However, following the river bed east, it can be seen to originate from the region of the Salar Uyuny salt lake (approx 80 miles to the north - The large white object in the middle pictures, above). It is a reasonable to assume therefore that the complex was in operation at a time when this was a living lake, which would have supplied the area with all its water needs. Presumably, at some time in the distant past, when the lake was still filled with water, it would have flooding down onto the flatlands (seasonally? ), engulfing different parts of the region in the process. If this was an agricultural operation, the annual flooding would have changed the course of the rivers, depositing large amounts of nutrient-rich silt in the process, a process which would have been invaluable to large-scale agriculture. The suggestion that the nearby 'Atacama Giant' was built as a lunar calendar to predict the seasons, supports the idea that parts (at least) of the complex were built for agriculture. This discovery was first noted by Ms. Holly Ahlberg (Nov, 2012) from whom the inspiration for this article came. At present, and following several e-mails to archaeologists and academics, there has been no reply concerning this discovery. The following images are taken from Google, and clearly show a vast and incredibly well laid out grid-network of fields and/or possible housing. Other structures such as canals, roads and civil structures have been tentatively identified. Section of the neatly aligned grid-layout of the complex. The vast network of grid-aligned plots extends for miles. These pictures only show the smallest fraction of what what can be seen to have once been a vast complex extending out in the flood plain for several miles, consisting primarily of (several) thousands of similar plots, tightly grouped and laid out in neat grid formations. It is clear that whoever built these structures, they were well organised and the complex must have been of great significance when it was in operation. From what can be seen on Google-earth, it appears that many of the constructions lie beneath silt deposits, whilst others were built over pre-existing deposits, suggesting that what we are looking at is a complex that was built in several phases separated by different flood events, and/or over a period of time. The presence of numerous 'canals' leading to the structures highlights the possibility that it was built where it was because of the availability of water running from the now dried up Salar Uyuny salt flats (Once a freshwater lake and over 80 miles away). The observation by Ms. Ahlberg, of the similarity in appearance between the areas of the site and modern salt-beds, certainly seems very credible in light of the environmental conditions, high salt content from the lake (particularly at the end of its life) and the location of the site in relation to the Inca highways, and by the sea - both of importance to a large-scale industrial operation. The Road to Nuevo Albergis: Northern end, junction of Road to Bolivia. (The 'Atacama giant' lies just to the North). The road was built over an ancient river bed (left), and was submerged by a different flood event (right). The same road was built over parts of the complex (left), and leads to contemporary structures (right). Areas of the complex showing evidence of what appears to be an agricultural imprint. A walled section of the complex built on higher ground, and partially washed away by river erosion. The presence of what appears to be walled canals leading from the surrounding riverbeds. An enclosure surrounded by a protective stone walls with circular markings inside. The Atacameno people built circular, honeycombed dwellings as seen at the Archaeological village of Tulor. Some of the structures have what appears to be evidence of walls and entrances between plots. Who Built It... Possible Candidates. Evidence for occupation at nearby San Pedro begins surprisingly at around 11,000 years ago; It is currently believed that bands of hunter-gatherers lived along the Atacama coastline from 11,000 BC to 500 BC, with the first fishing settlements appearing around 5,000 BC, and Tiwanaku artefacts appearing at about 700 AD. Around 2,000-1,000 BC, the Atacameño people fully adopted the sedentary culture. At this stage, they had an economy mainly based on llama breeding and maize agriculture. Between 400 BC and 100 AD, Atacameño farming reached a peak in its development. 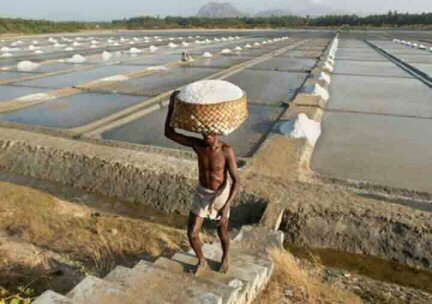 (1) As such, this is the most likely candidate for such a large scale operation of farming. However, regional climate records for the time, based on the periodic appearance of certain plants in the rock records, indicate that there was a period of greater rainfall across the Andes above the Atacama between 5,800 BC and 4,700 BC, which would have charged groundwater reserves in the usually dry desert of northern Chile and southern Peru. The Atacameno settlement of Tulor is one of the oldest and best-preserved Neolithic villages in South America. The architecture of the time had circular clay buildings, joined together, and with patios and passageways that communicated with one another. The rooms, whose foundations were set up on previously excavated grooves, were built in adobe in an arched form that reached a height of almost 2 meters, and finished off in a conical roof held by wooden poles. (7) They bear no resemblance however to the Nuevo Albergis structures. The nearby archaeological site of San Pedro de Atacama is a Tiwanaku Empire outpost, located in a desert oasis some 800 kilometres from the capital of the Tiwanaku empire, and at 2,430 meters above sea level in the foothills of the Andes mountains in the Atacama desert of extreme northern Chile. Whilst this appears to be a completely different system of agriculture to the Tiahuanacans, (who preferred to use the raised-bed systems), the sheer scale of the operation suggests that it was both important and likely fed thousands of people, more than could be accounted for in this otherwise dry desert region of Chile. Perhaps what we are looking at here is a regional 'wholesale' supplier of food to one of the larger cultures such as the Tiahuanacan or Inca empires. Although rain rarely falls on the Atacama's coastline, a dense fog known as camanchaca is abundant. The fog nourishes plant communities called lomas, isolated islands of vegetation that can contain a wide variety of species, from cactuses to ferns. 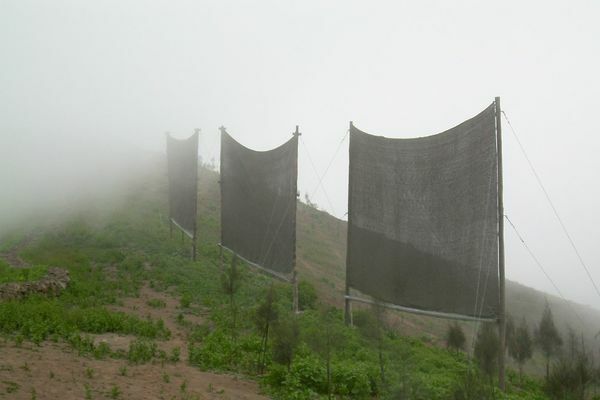 The success of the cheap Chilean fog-catchers has inspired people in countries such as Peru, Ecuador, South Africa, and Namibia to develop similar systems for their arid-land homes. For more information on the innovative art of fog-catching, go to www.idrc.ca/nayudamma/fogcatc_72e.html.